Finally got that project started! 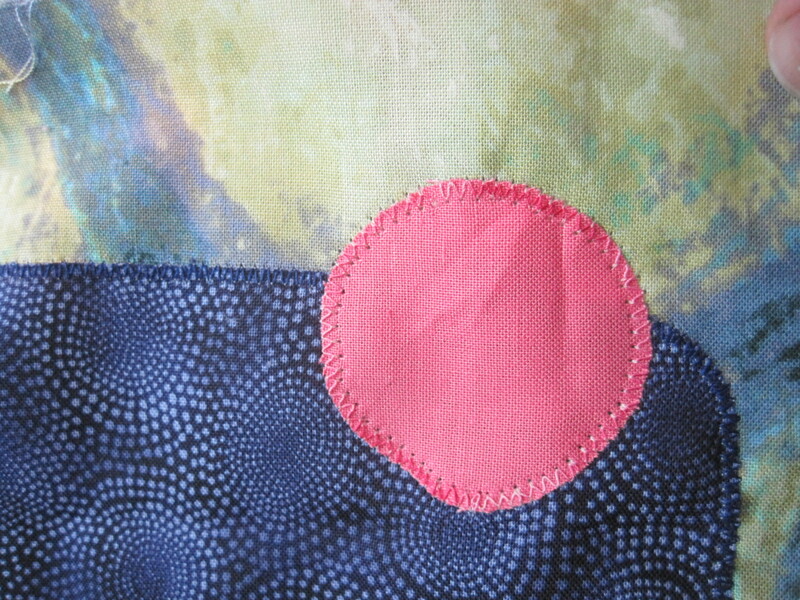 Once you give yourself permission to cut into the fabric, EVEN IF IT FAILS, things move along very nicely. 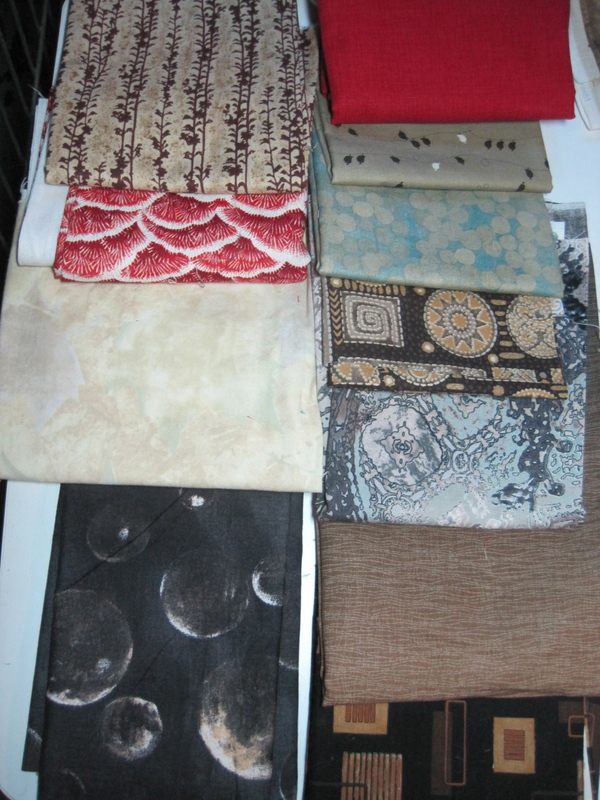 Here is the group of fabrics I ended up with. I still had quite a few fabrics on the side that I thought might work. I decided to do this one a little differently than the last two (where I cut the pieces and placed them directly on the batting and backing.) 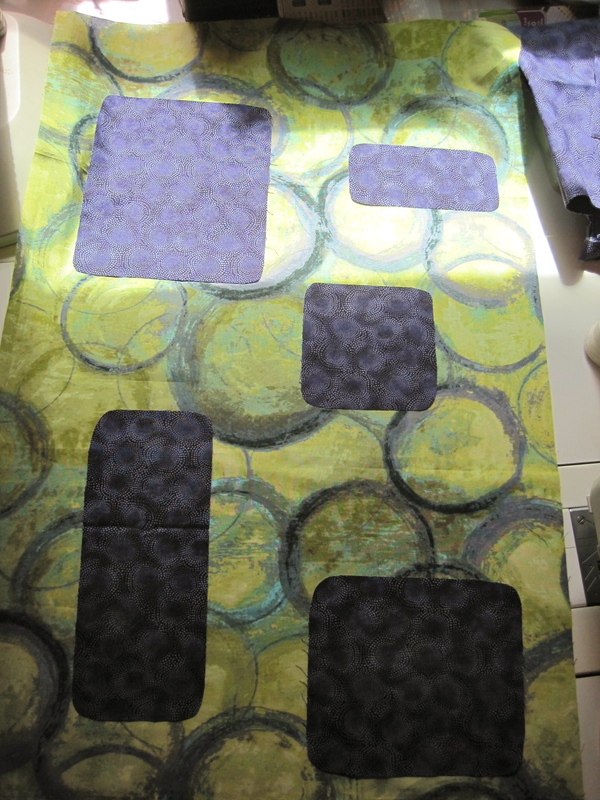 I chose a background fabric for the quilt top, and raw edge zig zagged the pieces directly to the top. I knew this would work because of my other experiments with my zig zag technique. You have to know I laugh every time I say that. Its not like I invented the zig zag stitch or anything. First I added the squares and rectangles of dark blue. Everything was cut free hand for this. I rounded the corners of the blue before I zig zagged them in place. 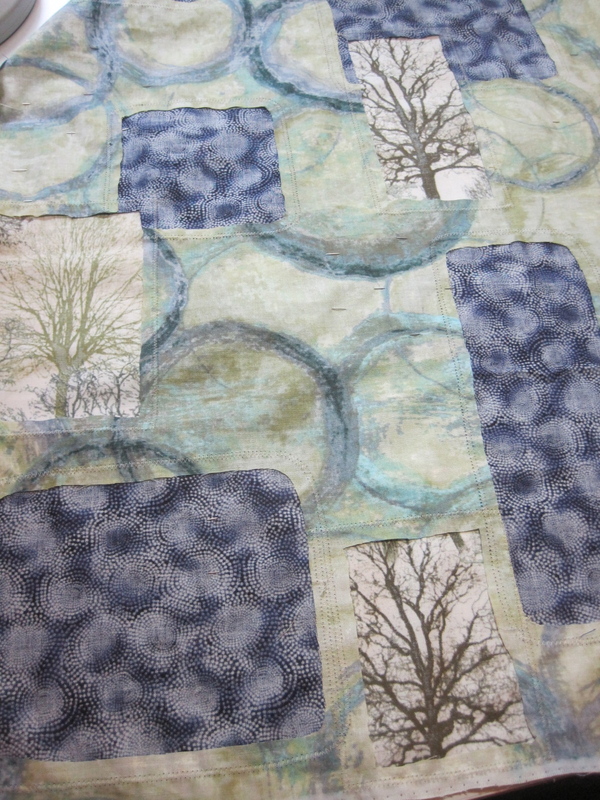 Then I added some of those wonderful trees that I also included in the last quilt. 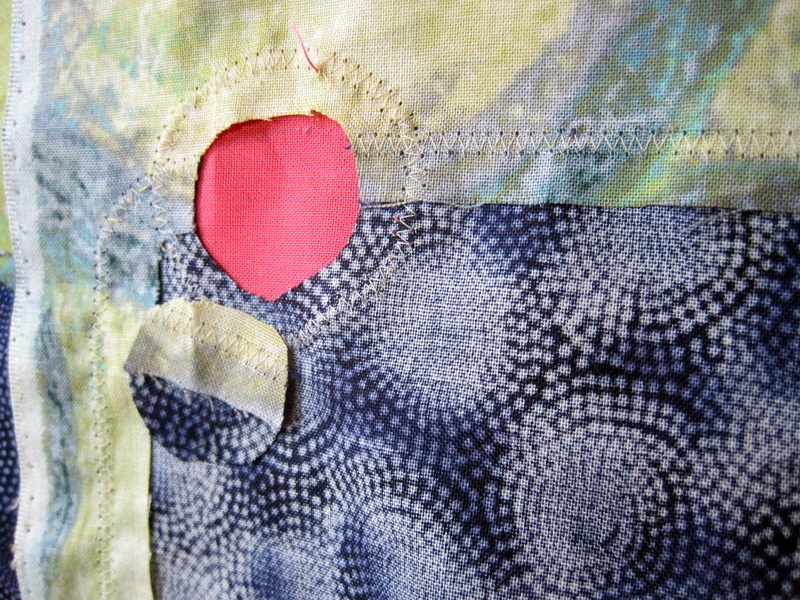 After each group of fabrics was zig zagged in place, I carefully cut out the back so that there was still essentially only one layer of fabric. I don’t always do this, but I thought it might make a nicer end product. I had to let it rest a day before I decided to at least try adding circles to it. I likey! You can see I thought I was done with the circles, and then even before I put it up on the design wall I knew I needed to add a few more. So I pinned those in place and put it on the design wall. Then every time I walk by I take a quick glance at it to see if I still like it or if it needs something more. Right now I still like it. Oh! 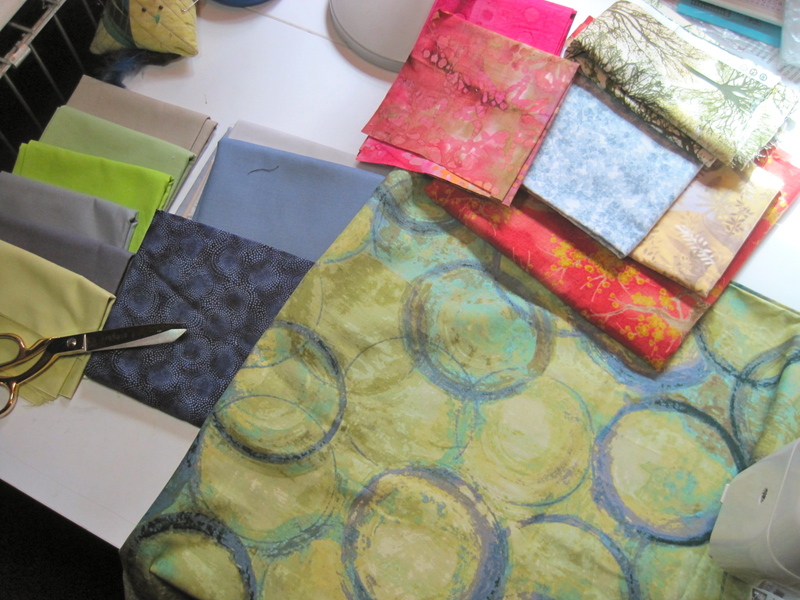 And before I even did the circles, I got enthusiastic about the whole group of fabrics that I had gathered, and I cut a strip from each one, and sewed them together in ‘strata.’ I think they’ll make a great project along with the two fabrics I have included in this picture. So that’s pretty much what I’ve done for the past few days. A little knitting, a little walking, a little reading and praying, and just a bit of TV watching round out the day. I don’t really like watching TV. Its just an excuse to sit and let the dawrgums have some lap time LOL. I’m having a little trouble starting my next quilt project. 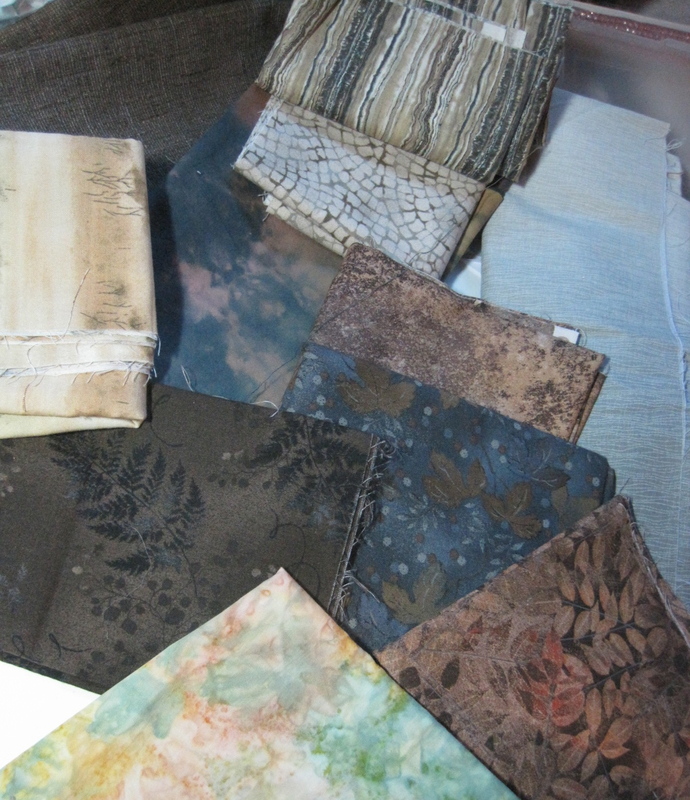 I have the fabrics picked out. The iron is on. But I have yet to cut into the fabric. I decided to delay the start and come over here to write about yesterday’s work. Another finished quilt! (This one only took 7 or 8 years :)) I started it many years ago. I loved so much working on each and every block. 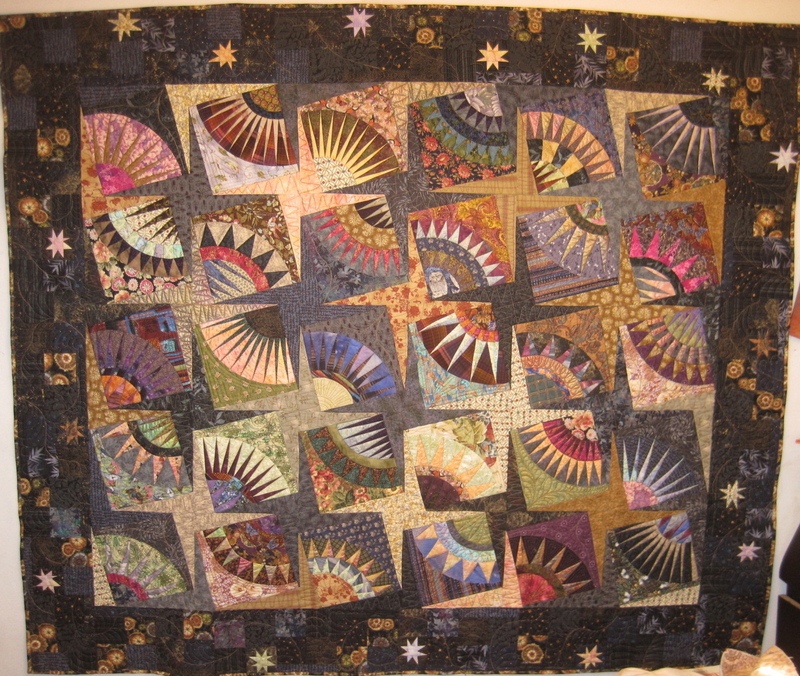 This is a famous New York Beauty quilt designed by Karen Stone. 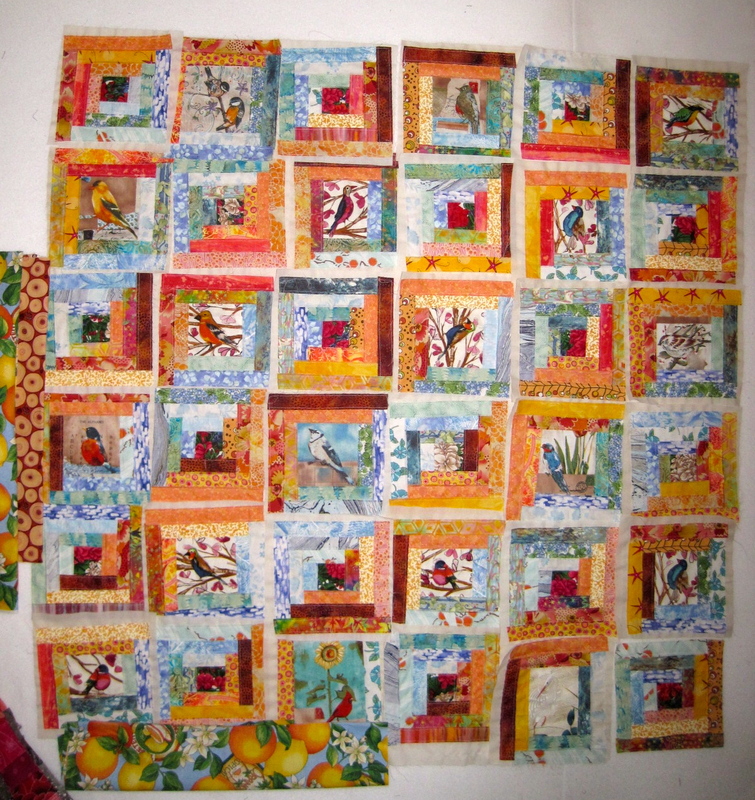 Each block is paper pieced. 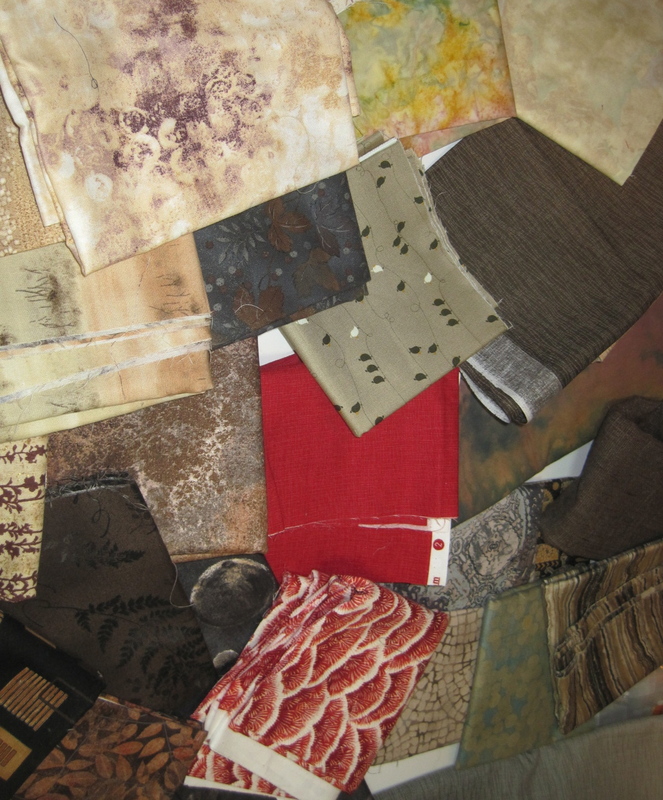 I would sit on the floor and pick through my fabrics to choose just the right combination for each block. Once the blocks were finished, you had to put them together with those wonky stars so that each block was tilted. That was boring, so that took a LONG time. And then came the border. 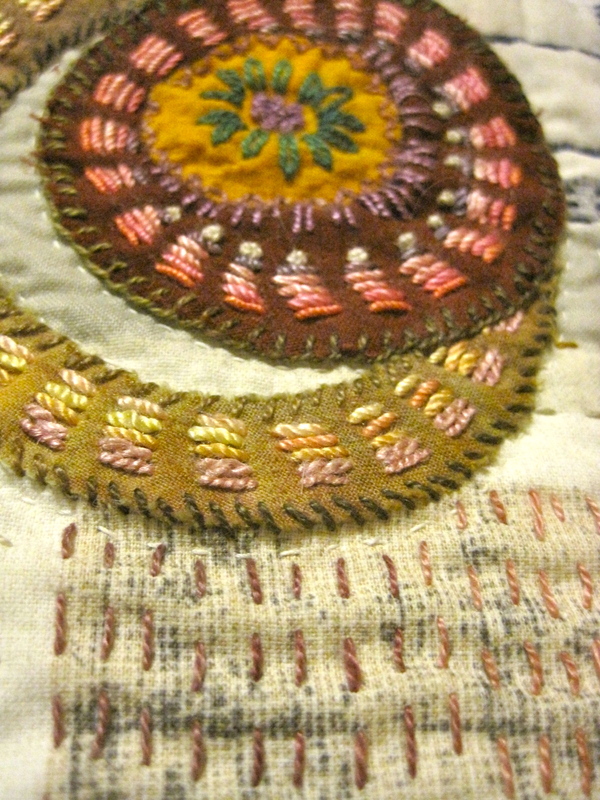 The original pattern included a paper pieced border in a curvy saw-toothed pattern. That was a LOT of paper piecing. 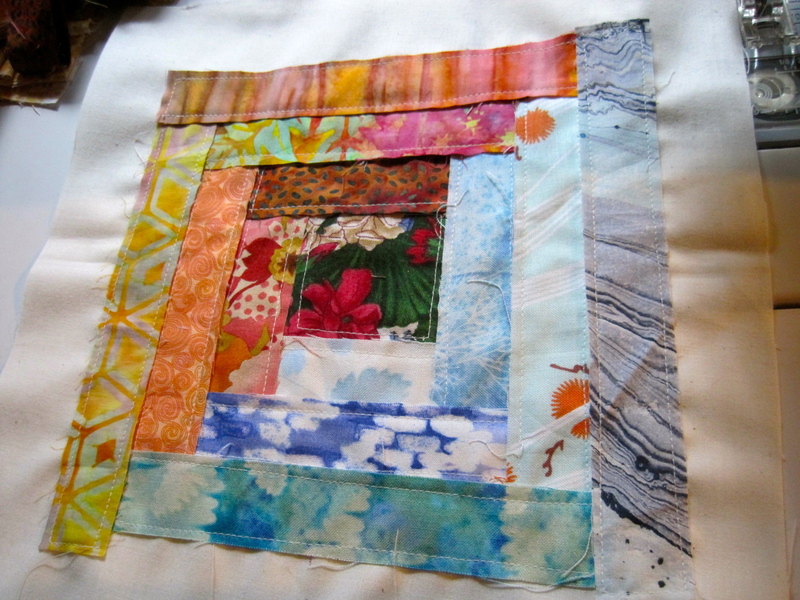 It took a couple more years for me to give myself permission to do a different border. I am very happy with the way I did the border. I did some tiny liberated stars a la Gwen Marston, and added a print that seemed star-like to me, and used a lot of black and navy blue prints to piece a border. Ah. And then it needed to be quilted. I didn’t think myself qualified to machine quilt such a pretty quilt. 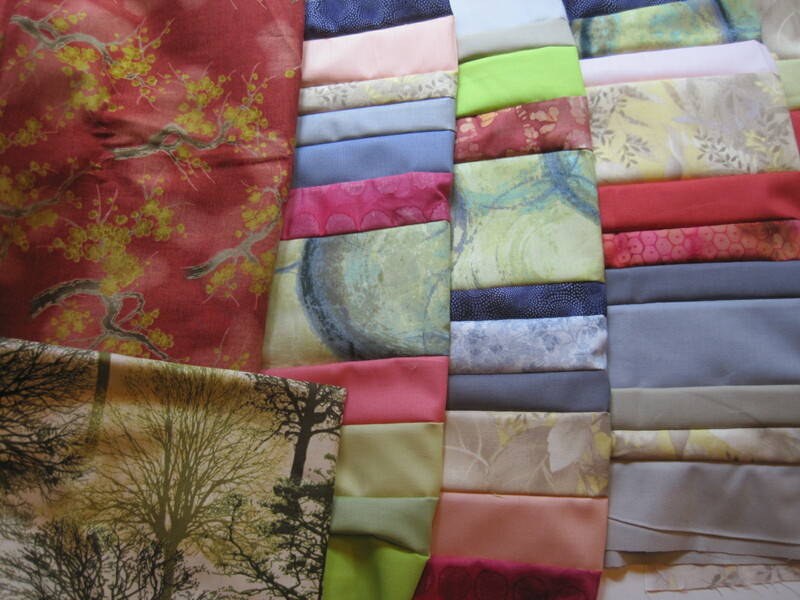 But with all the many seams, it didn’t seem right to hand quilt either. Finally the day came. I made a rough template of the curved side of the blocks and drew out about 5 different patterns I could free motion quilt in each one. Most of the rest of each block would be stitch in the ditch. 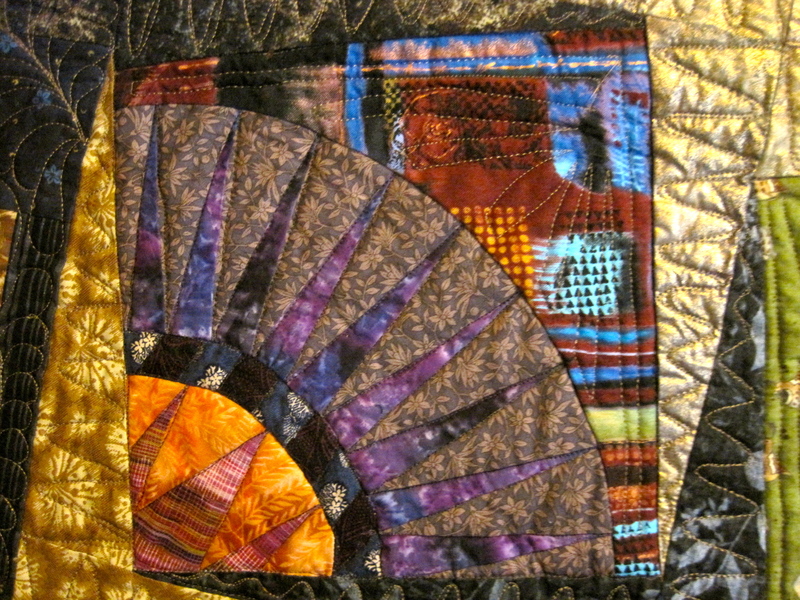 It took quite a bit of time to get the center quilted. And then I had to figure out how to quilt the border. I decided to outline each star, put some swirls on the star-like print, and do the rest in feathers. It wasn’t particularly hard to do. But for some reason (probably the housetop quilt project) I put it away and didn’t look at it for another year or so. 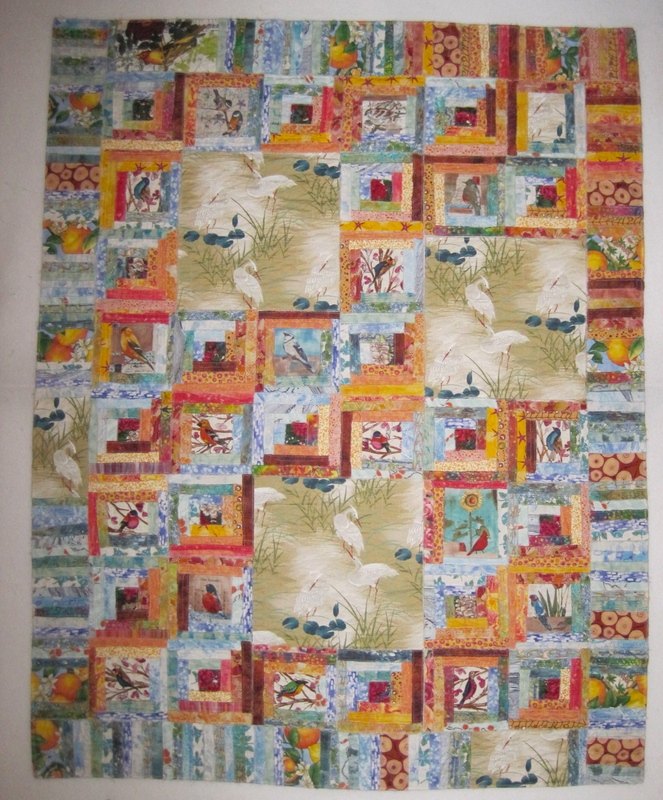 After finishing that log cabin quilt, I decided I would like to finish another quilt. I got the New York Beauty out and was surprised that all I needed to finish was one border! Good grief. I could have used it this past winter. 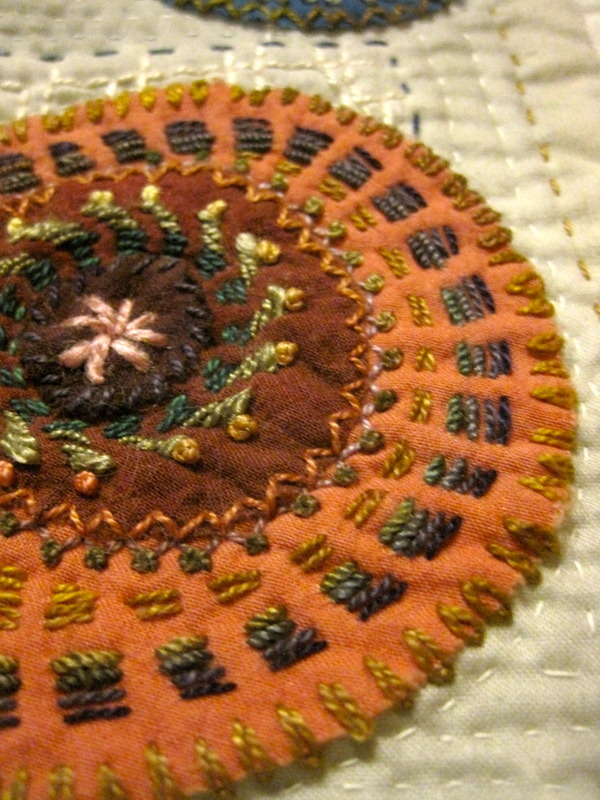 Anyway, I finished quilting the border and put the binding on yesterday. It sure is fun to finish a quilt project. 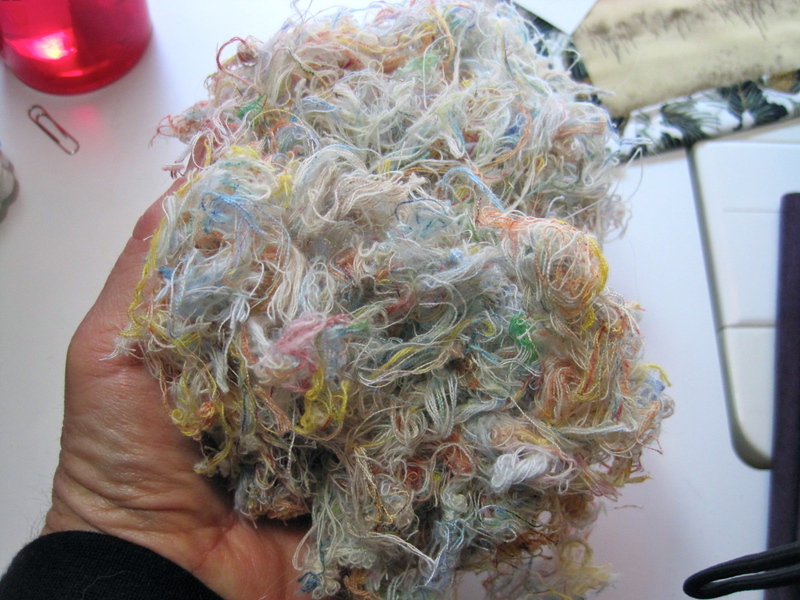 For this one I tried tearing the fabric. I like the texture that it adds. I’m not sure how much difference it will make in the long run. 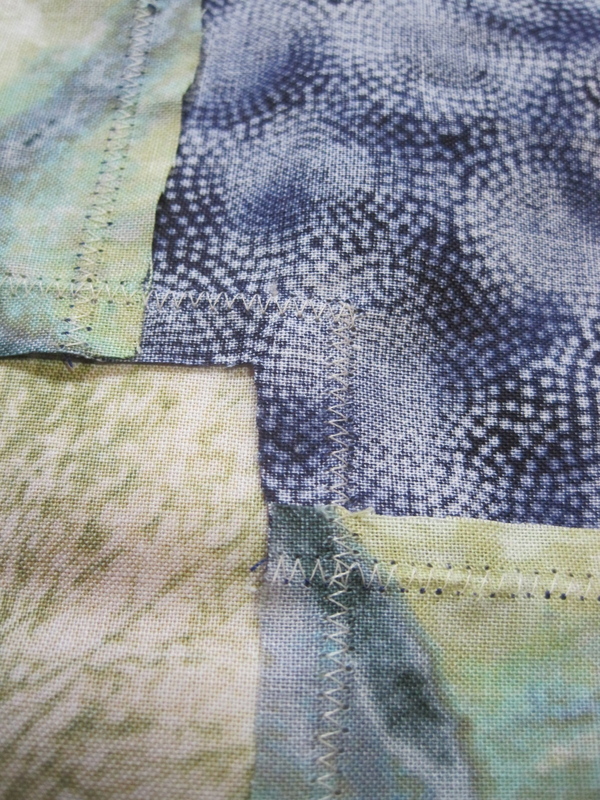 But I straight stitched the torn fabric and zig-zagged the edges of the cut fabric. I think it’ll add a little texture. 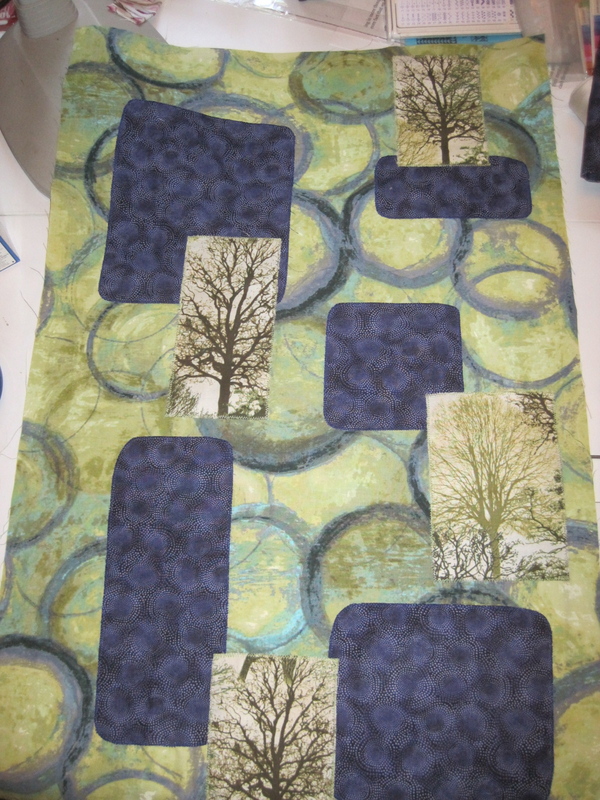 If you remember the picture of the fabric I had laid out for this quilt, you will notice that I added a few pieces. 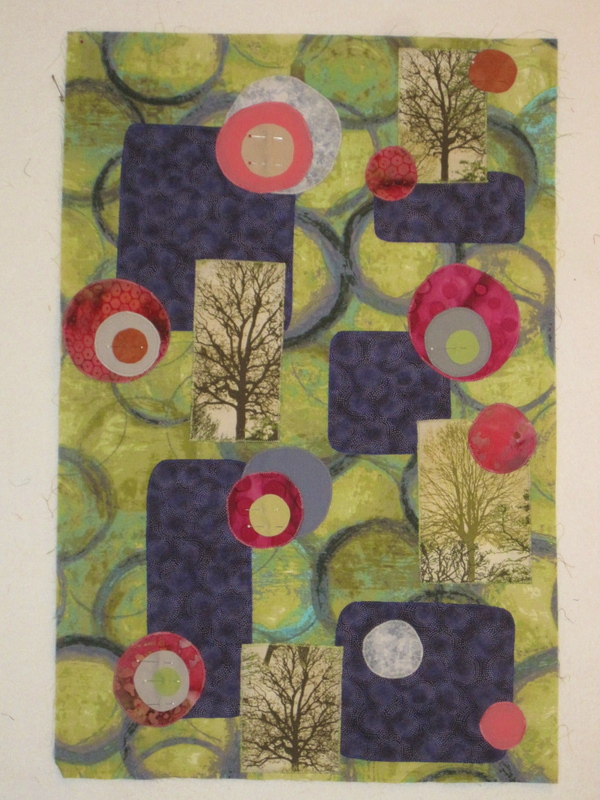 It needed a little punch of color, so I looked through my greens and chose the one mosaic-y looking one, and then I found the fabulous tree fabric, and had to add a bit of that. 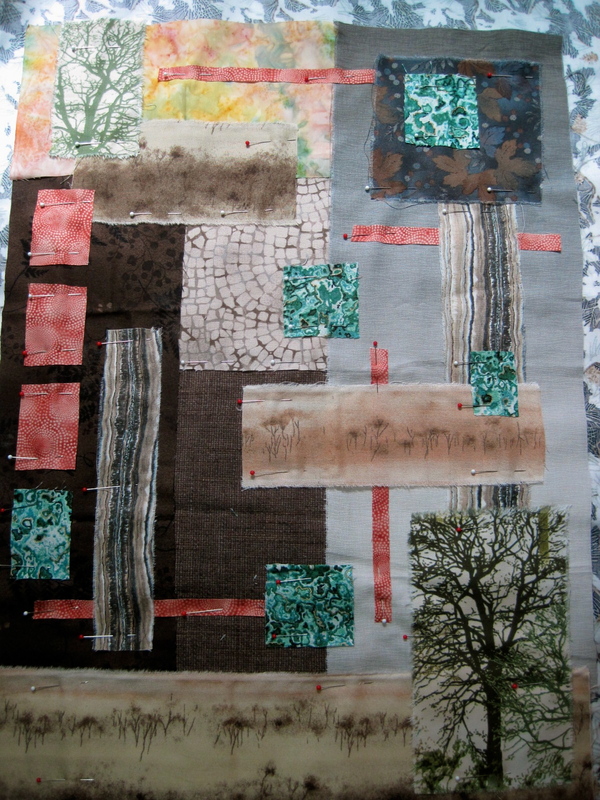 Here’s a pic in process–all pinned in place and ready to quilt. And here’s the end product. The color is a bit off in this picture. This is a small quilt too. Maybe 13″x16″. 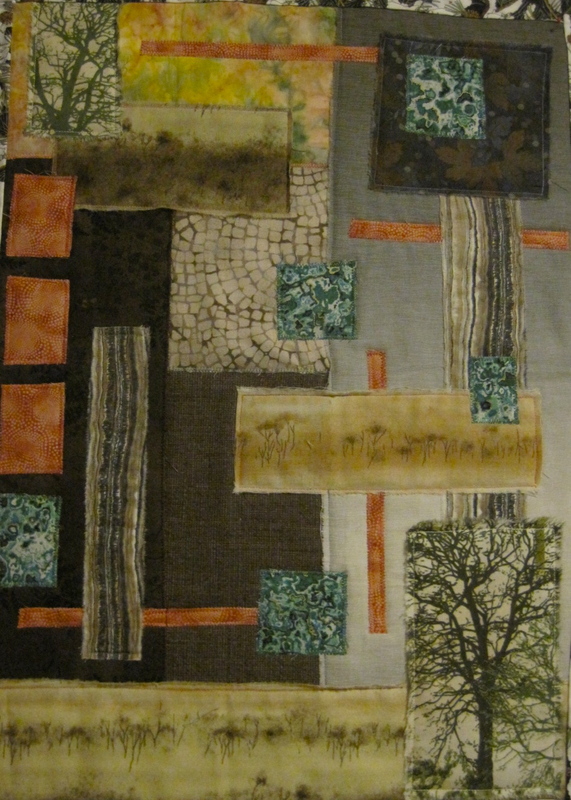 I love the organic look of these quilts. 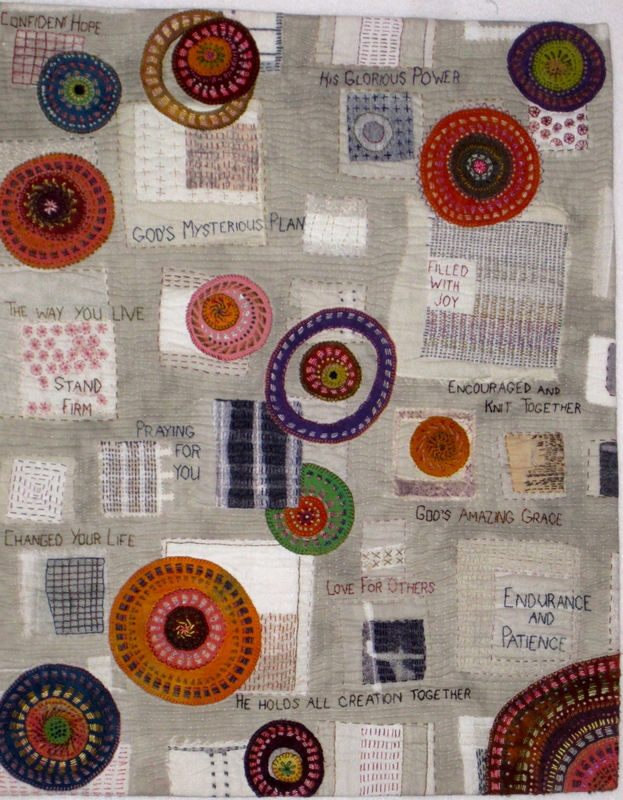 If I continue on with them, I am thinking of making them a series of quilts called “Psalms.” There is such a lot of beautiful imagery in the Psalms. 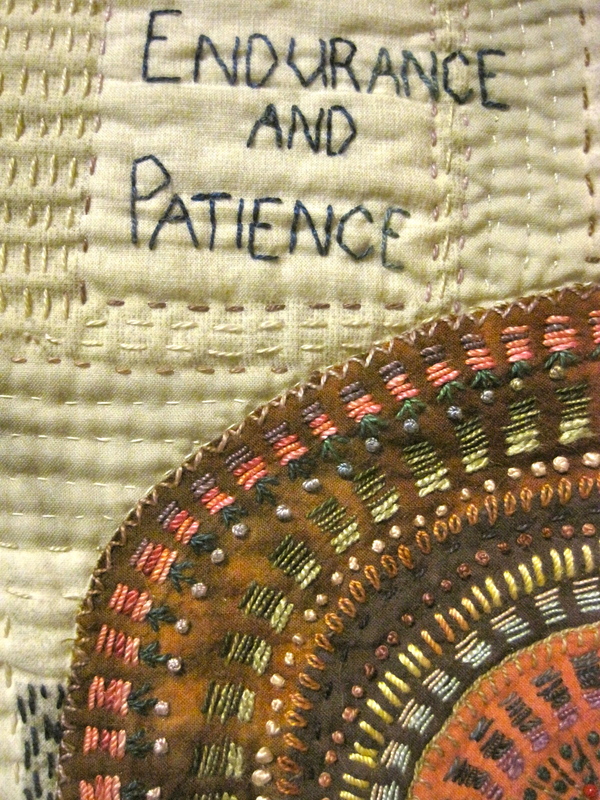 I think it might provide the perfect words to put on these quilts. And completely unrelated, here is Noah. He LOVES his couch. 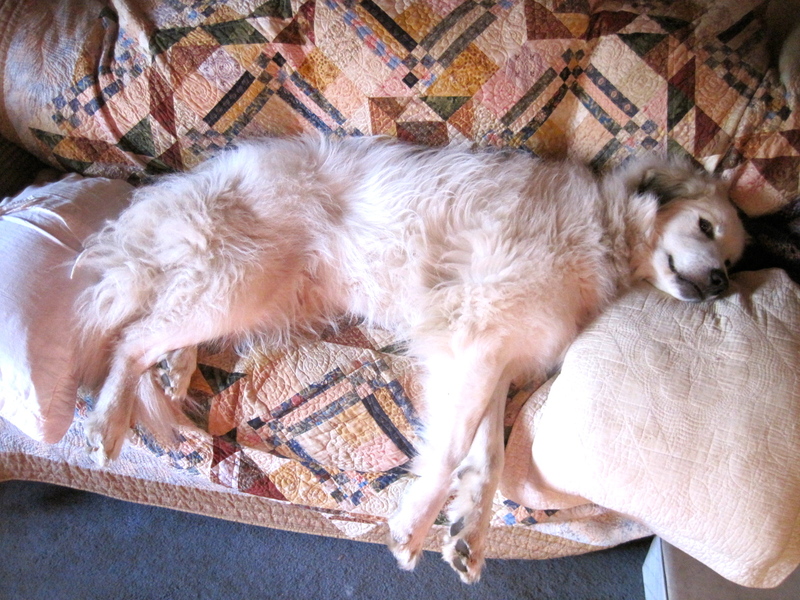 I hate this couch, so I’m glad somebody is enjoying it! In honor of International Quilt Weekend, I took a little break from the log cabin quilt to play! 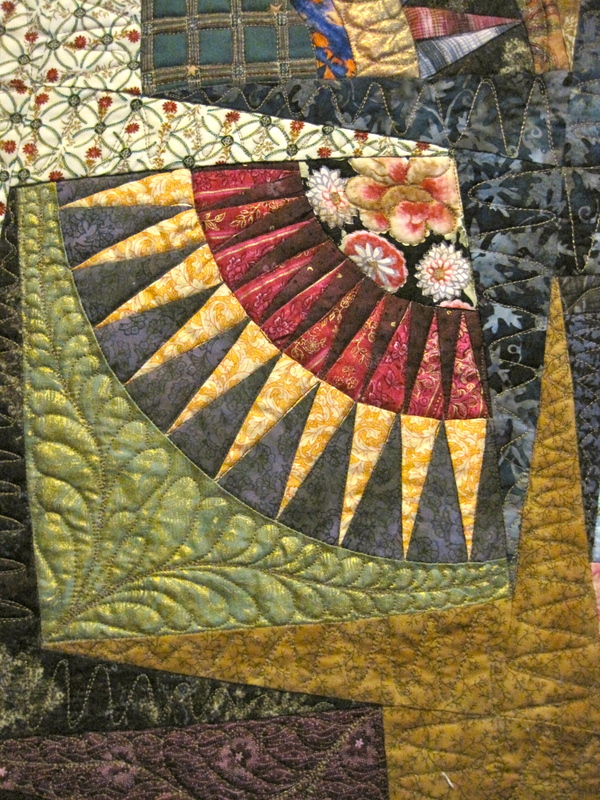 My Quilting Arts magazine arrived Saturday, and I looked through it during my afternoon coffee break. I saw something that inspired me to work with a specific palette of colors, and I kept thinking about it, so that night before I went to bed I pulled out a ton of fabrics and auditioned them. These are the ones that made the cut. The next morning I got up and thought, hmmm, the ‘rejects’ make a pretty nice palette too. I LOVE it! 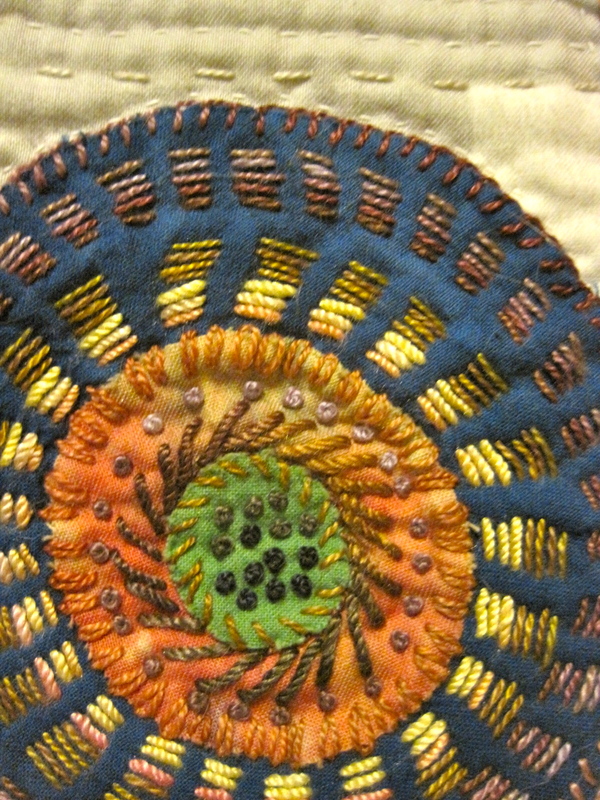 I am hoping to use it to add a lot of hand stitching on. 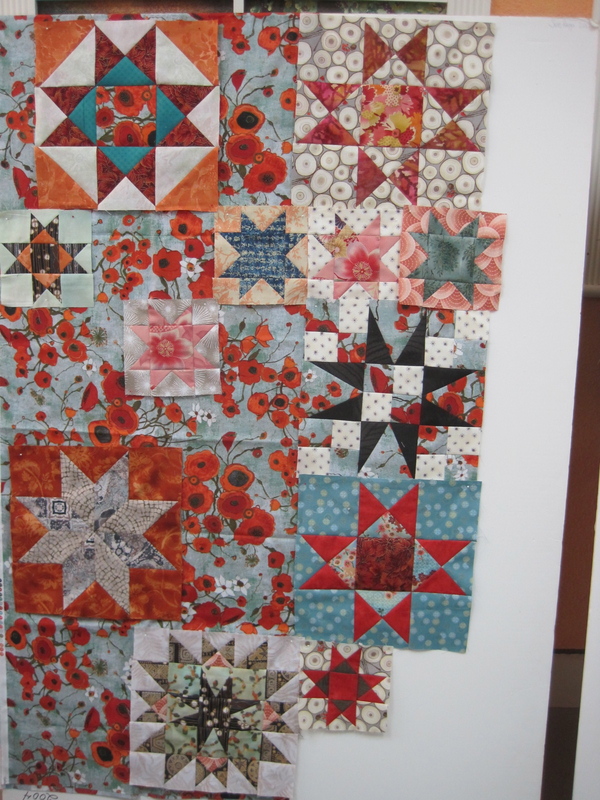 Today I hope to get the log cabin together and make the second small ‘inspired’ quilt. 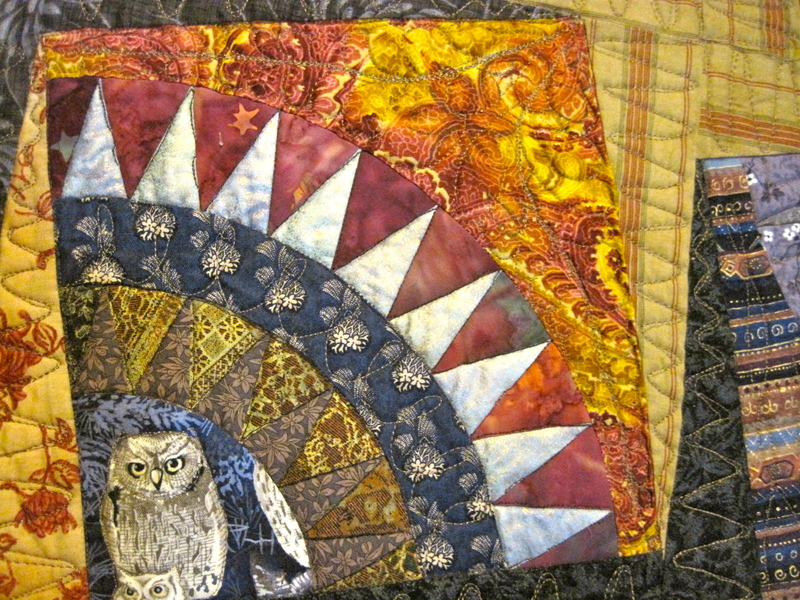 I almost forgot to write about the great quilt workshop I went to last weekend! It was Alex Anderson’s classic Stars workshop. It was a perfect getaway. Alex holds her workshops in the beautiful Alden Lane Nursery. The people at the nursery are so friendly and accommodating. They provided us with a wonderful gourmet luncheon held in the greenhouse each day. 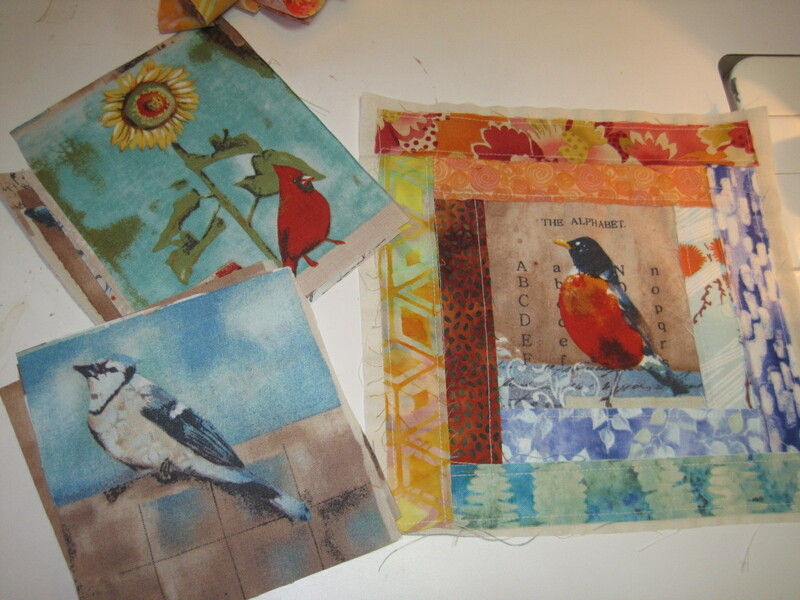 But back to the quilting! Alex is a wonderful teacher. She knows what she’s talking about, but has such a friendly and relatable manner that it makes you feel relaxed even as you learn new techniques. This was just what I wanted for this weekend. A lot of creativity and NO stress! I used to love making stars. They were one of the first things I fell in love with after I started quilting. 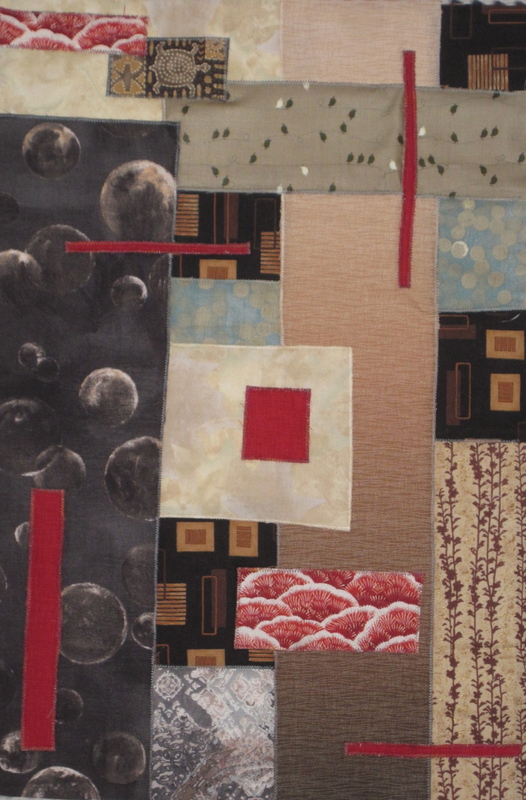 But for the last year I’ve been working on more abstract and improvisational quilts, and working on points and matching seams were a far cry from what I’d been doing. Alex led us through a series of exercises, doing increasingly difficult stars. Here’s what I was able to do in 3 days! I’m very proud of that one Le Moyne star! I followed her directions exactly, and what do you know? It worked! 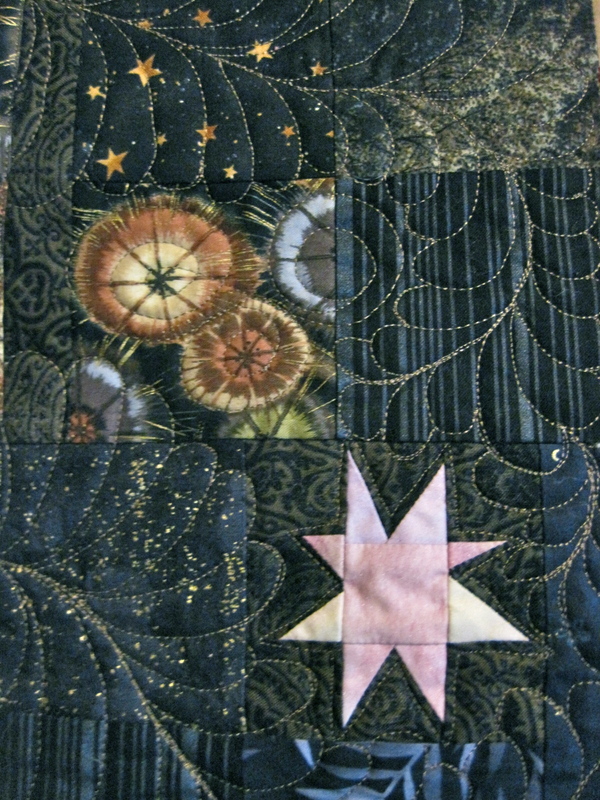 The stars are laid out on the focus fabric I chose. I really love this poppy fabric, and I am hoping to make a new quilt for my bed with the poppies in the background and the stars kind of floating on top. We’ll see if that works out.